Chair and framed photograph carved 1912, Felsted School, Essex, England . Who was Nellie Payne? 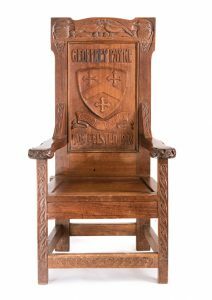 Chair, Felsted School, Essex, England. 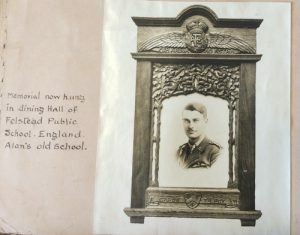 Framed photograph, Felsted School, Essex, England. Both of Nellie’s sons attended Felsted in Essex when they lived in London – Geoffrey for 5 years and Alan for 2 years. 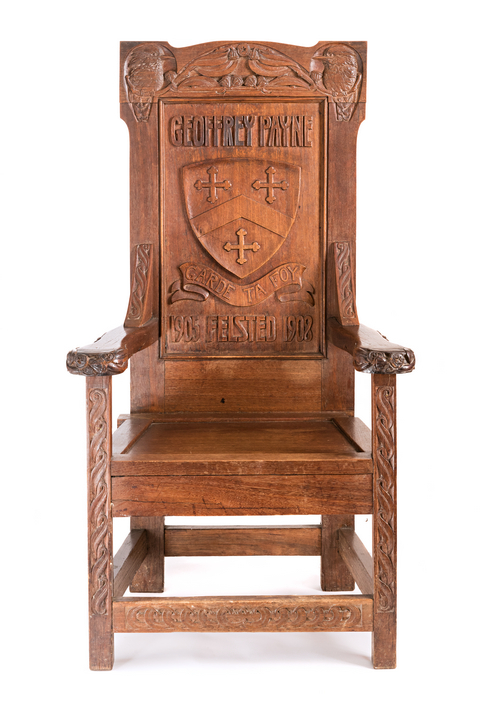 In late 1911 Nellie had learned that Felsted was building a new speech hall, and that every living old boy was being asked to give a chair with his name carved on it as a memento of his school days. The idea appealed to her immensely, and she set to work at once to design a chair which would serve the stated purpose and, at the same time, do honour to the school. In a timber yard in Hobart she found at last the kind of timber she wanted – some Bluegum planks that were known to be at least sixty years old, stout, well seasoned stuff that was probably a legacy from the days when Hobart shipwrights valued Bluegum very highly for building whalers and other seagoing ships. 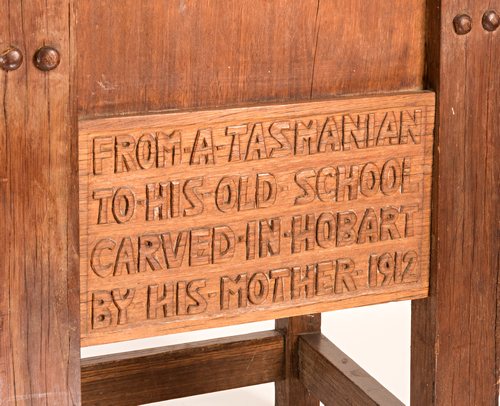 Those planks she fashioned into a chair of her own handsome design, which embodied a representation of the leaves and seed pods of the eucalyptus known as Bluegum, Tasmania’s floral emblem. She often employed the eucalyptus as her motif, for its bold outlines and broad rhythms appealed to her aesthetic sense. 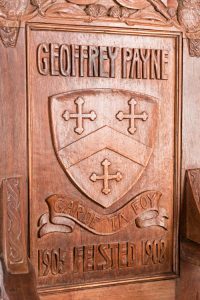 The Felsted governors acknowledged the gift with warm expressions of appreciation, and the chair was given an honoured place in the new Grignon Hall. Some years later Nellie learned that the hall had been burned down, and she feared that the Geoffrey Payne chair had perished with it. But the Fates had been kind. To anxious letters of inquiry the school replied with the reassuring information that the chair had previously been moved to another part of the school, and so had escaped destruction. 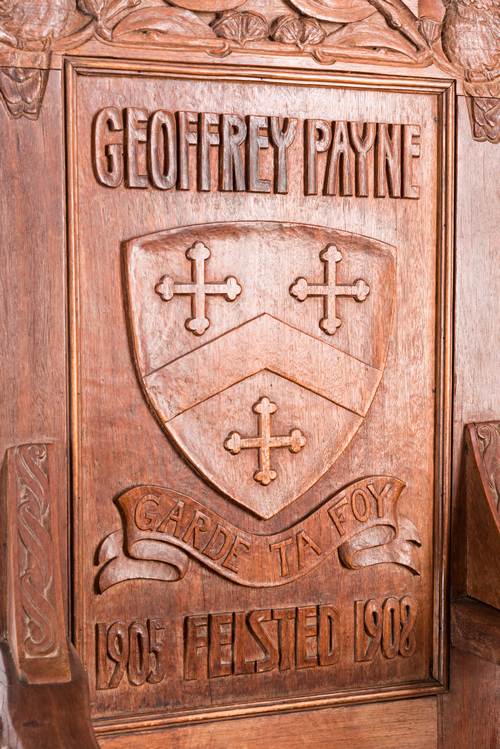 The back of the chair has been carved with the school crest and the motto “Garde ta foy” which is French for “keep the faith”. 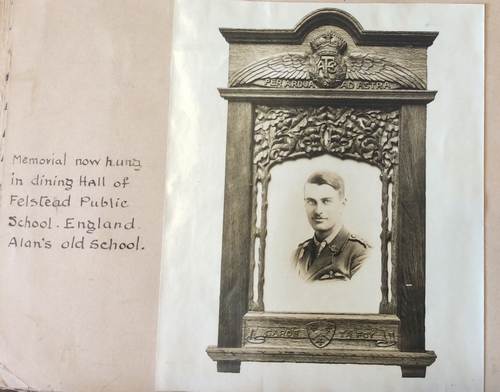 Later she presented a photograph of Alan to the school and carved the frame with oak leaves. It was hung in the school’s dining room.